On Friday, Pakistan Cricket Board (PCB) unveiled the full schedule for the latest edition of Pakistan Super League (PSL). The event will kick off on February 14 in Dubai and the final of the fourth edition will be played on March 17, at National Stadium Karachi. According to the schedule, last 8 matches of the forthcoming tournament will be played in Pakistan. The star-studded tournament will kick start with a glittering inaugural ceremony, followed by an opening game to be played between defending champions Islamabad United and revamped Lahore Qalandars at Dubai Cricket Stadium on Thursday, February 14. In the first phase of the tournament, seven matches will be played in Dubai until February 17. The next leg will be hosted in Sharjah from Feb 20th to 24th for the next eight matches of the mega league. Teams will return to Dubai on 26th Feb for another seven matches before going to Abu Dhabi for just four matches on 4th and 5th March. 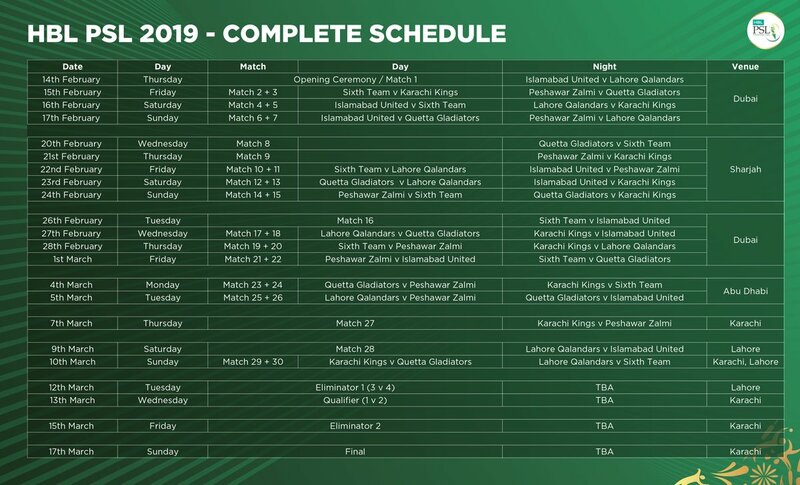 Pakistan’s own T20 league will come home from March 7th for the last eight games of the tournament including the qualifying rounds, eliminators and the final.